Cloud9 Nabs Top Accounting Cloud Hosting Award! Cloud9 Real Time has been honored with the 2012 Reader’s Choice Award by CPA Practice Advisor for favorite accounting ASP/Hosted Solution Provider. 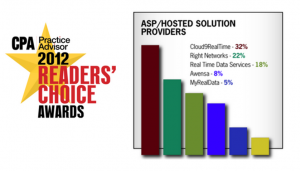 The new category of ASP/Hosted Solution Provider saw Cloud9 Real Time garner nearly 33% of the vote and trump the 2nd and 3rd place providers by over 10% of total readers polled. Cloud hosting applications is an increasingly popular solution for accounting firms and other small to medium sized businesses that need anytime, anywhere access. Users can login from any PC with internet connection anywhere in the world at anytime. Another great benefit of moving to the Cloud is that the business owner no longer needs to buy the hardware or pay IT consultants for the maintenance and technical support, thus reducing the overall IT expenses by up to 70% each year. Cloud9 Real Time is licensed by Intuit and Sage as a Commercial Host and Accredited by MSP Alliance as an authorized Managed Service Provider in both the US and Canada. Offering a customized and privately labeled all-in-one virtual office solution, with advanced Accounting hosted solutions you can have an online portal with instant access to QuickBooks, Sage Products, Microsoft Office, Tax Preparation software and other applications. Providing clients with a custom built server, the Private Cloud solutions offered by Cloud9 are tailor made for the individual businesses needs.